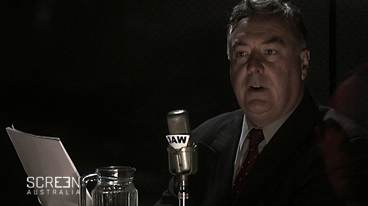 Video clip synopsis – With the “Forgotten People” radio talks, Robert Menzies begins reaching out, pitching himself in more domestic, family friendly, homely terms. The Forgotten People Speech is an excerpt from the film Menzies and Churchill at War (55 mins) produced in 2008. With the “Forgotten People” radio talks, Robert Menzies’ version of Franklin Roosevelt’s great “fireside chats” pioneered in 1930s America, Menzies began reaching out, pitching himself in more domestic, family friendly, homely terms. His great razor sharp wit and eloquent stump-style oration is left to one side. He concentrated on speaking directly, powerfully, lucidly, simply, and well. This was not 100% per cent new Robert Menzies of course – he had always been able to communicate like this. But the emphasis had been honed, and the new medium, radio, took him right into the domestic sphere of Australia – the kitchens and parlours. In a great coup for the 1949 election campaign the Liberals headhunted the publicity company who had run Ben Chifley’s 1946 campaign. They used the company to pitch Menzies as the friend of ordinary Australians. They also set about remaking Menzies, trying to completely overturn the image of him as aloof, out of touch, arrogant, superior. They succeeded brilliantly. This, finally, was Ben Chifley’s great miscalculation in the 1949 election. Chifley could never quite bring himself to take seriously the prospect of Robert Menzies being voted in by the electorate. He had been rejected too many times. But Menzies managed it and regained power after eight long years. In regaining power Menzies reconstructed not simply the Liberal cause – by creating the modern Liberal Party – but also reconstructed himself. Although his core values remained the same, he managed to change the way he related to ordinary Australians. Note-making: While watching clip… individual, group or teacher directed…confer /discuss afterwards. Note the lesson Menzies learned while serving in the opposition. Note how he maintained his ‘presence’ with the electorate. Who were the ‘forgotten class’? What did the ‘forgotten class’ mean for Menzies? Note the impact this ‘class’ would have on Australian politics. What was the difference between Menzies’ view of Australian politics and that of the Australian Labor Party? Explain the appeal of Menzies’ new ‘Liberal’ party to the Australian electorate.